This article is based on a talk Ben Allanach gave to a group of school students at the University of Cambridge in June 2015. You can see a video of the talk here. As a theoretical physicist I spend a lot of my time thinking about fundamental particles smaller than an atom. But I also spend some of my time thinking about the Universe, which is about as big as you can get. That sometimes happens within a day; I have to shrink my mind and then grow it. It reminds me of Alice in Wonderland: you drink a potion and become very small; you eat a mushroom and you grow very big. I'd like to take you on a journey to the very small and the very large. Let's start with the very large. 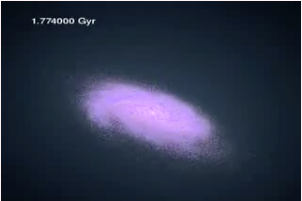 Below is a computer simulation of a galaxy just like ours, evolving through time. Each one of the small dots represents a star just like our Sun. The stars are rotating around the centre of mass; it is a spiral galaxy. When we look out at other galaxies we can measure the speeds at which these stars are going around the centre pretty well, using the light that is given off by the stars. We can also use the standard theory of gravitation to predict how fast they should be going. When you compare the predictions from the theory to what is measured you find that something doesn't add up. The stars around the outside are going way too fast compared to the theory, so something has got to give. Maybe our theory of gravity is wrong, or maybe it is something else. Many people have tried to tinker with the theory of gravity, which is due to Einstein, and even with Newton's theory of gravity, which is a lot older, to try and make this picture add up with observations. But it is very difficult to do that and at the same time keep all the other predictions of the theory that agree with observations. CERN from the air. Image © 2008 CERN. To find out what dark matter is and how it behaves we need to go down the rabbit hole. We need to shrink ourselves down to the size of a proton, which is less than a millionth of a billionth of a meter. And we need to travel to CERN on the border between Switzerland and France, where the Large Hadron Collider (LHC) discovered the famous Higgs boson back in 2012. 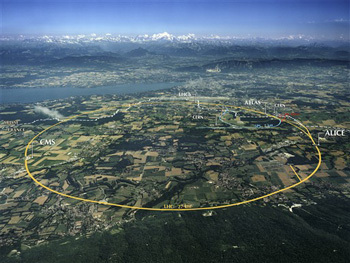 The yellow circle you see in the image on the right indicates where the tunnel that houses the LHC lies. It's 100m underground and it's big: the size of the circle line in London, 17 miles in circumference. The LHC is the biggest man-made experiment, the biggest man-made machine, that exists. 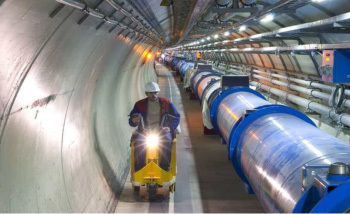 The reason the tunnel is so far underground is that the LHC needs to be shielded from cosmic rays coming down from space, which can pollute the data scientists collect from the experiments. The tube shown in the image below contains two beams of protons going in opposite directions. The LHC's aim is to discover new particles by smashing protons into each other and seeing what emerges from the collisions. The reason why the protons need to move very fast comes from Einstein's equation E = mc2, where E is energy, m is mass and c is the speed of light. It tells us that matter and energy can be converted into each other. But since the speed of light is very fast, you need a lot of energy to create a tiny bit of mass. So to have any hope that undiscovered particles are produced in the collisions, the protons need to have a lot of energy — they need to move very fast. The reason why the Higgs boson wasn't discovered before 2012 is that it is comparatively heavy. Earlier particle accelerators could not speed the protons up fast enough to produce the Higgs. 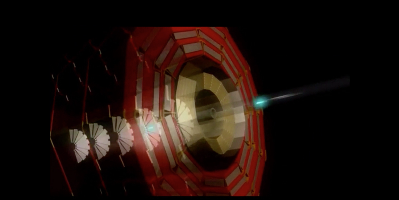 The movie below shows an artist's representation of protons speeding through the ring (it's not to scale, the protons are a lot smaller in reality). The three coloured dots within the proton represent smaller particles — quarks — that make up the proton. There are crossing points at which the two counter-rotational beams meet. Because the protons are so small, the beams are mostly space, so most of the time the protons just zoom past each other. Usually, when a billion protons go past a billion other protons only a couple of them will bump into each other and interact. Click to start movie. Movie © 2008 CERN. When two protons collide they burst into a thousand fiery fragments (see the movie below), which you can measure using detectors. You can measure various properties of these fiery fragments and then do some detective work to find out what happened the moment the protons hit each other. 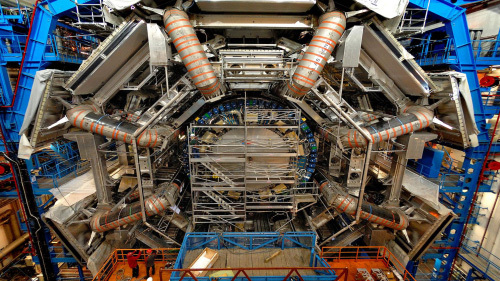 The detectors are very complicated beasts (the image below shows the ATLAS detector) which act as 3D digital cameras. They can detect the charge and the energy of the particles produced in the collisions. By using these machines you can find out all of the things that you want to know about the fiery fragments that are coming out of the collisions. The ATLAS detector. Spot the people in the bottom left corner — that's how big it is! Image © 2008 CERN. What does this have to do with dark matter? The answer is something called supersymmetry. Physicists know that their current theory to describe all the fundamental particles of nature is not entirely correct. As an example, think of the famous Higgs boson that was discovered at the LHC in 2012. According to the standard theory, the Higgs boson should be much heavier than the particle that was actually observed — a billion billion times heavier. This is hugely wrong, so something is wrong with the theory for sure. Supersymmetry is an extension of the standard theory that, so people believe, could fix the problem with the Higgs boson. But it also has another important consequence: if supersymmetry is correct, then each of the fundamental particles we have observed should come with a partner particle, which is heavier and also spins a little differently (particles behave a bit like little spinning tops). One of these supposed particles has just the right properties to be dark matter. You can calculate its properties using the theory. The particle is heavy and it is stable, so it would hang around in the Universe and not just decay into something else. It has no electric charge so it doesn't interact with light, which would make it transparent. You can even go further and say, "Well, let's take this speculative theory and predict how much dark matter should be around now". And indeed, the amount looks about right. It is really looking good. The only problem is that we haven't yet seen any of these supersymmetric partner particles. But the Large Hadron Collider has just started up again after an upgrade, and it has almost doubled its energy, so it will be able to observe heavier particles. I think there is a really good chance that in the next one or two years we should see those particles, if the theory of supersymmetry is correct. What would the discovery look like? The LHC wouldn't produce the new heavy particles very often, only in about one collisions in a billion. They would then quickly decay into some visible particles you can see and some dark matter particles. 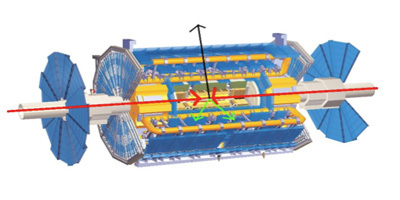 The picture below shows a mock-up of a detector. 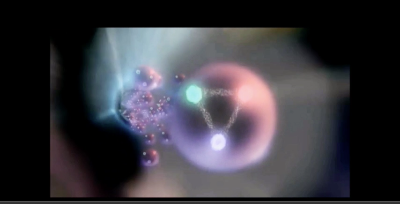 The red arrows represent the protons going in and the green arrows represent visible particles coming out. As you probably know from GCSE physics that the momentum of one or more objects is a quantity that is always conserved — it remains the same. Before the collision of two particles, there is not momentum except for in the two opposing red directions. Since it is conserved, the net momentum in any other direction apart from the red ones should also be zero. So if after the collision some momentum goes in the green direction, then the same amount must go in the opposite direction (indicated in black), so the two can cancel each other out. Dark matter acts like a thief that carries momentum away. If you see sufficiently many events with momentum coming out in just one direction (for example the green one), then you can infer that you have detected dark matter particles. This hypothesis must be tested statistically to be sure the observation is not just a fluke. Dark matter particles act like momentum thieves. Image © 2008 CERN. There are many detailed experimental tests you can do and the image below shows one of them — it's a cutting edge result. It represents particles being produced with their energy plotted on the vertical axis. The black points are the data that were measured in the first run of the LHC. 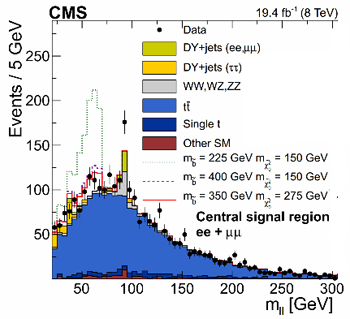 The plot is taken from this paper published by the CMS Collaboration. Standard theory tells us we should get the blue histogram. What we are seeing is some extra data, a bump. This could have happened purely by chance – you can calculate that if you ran the experiment on 100 LHCs, you would see fluctuations like this in three of the experiments, just by chance. That is not hugely unlikely, but it is fairly unlikely. So what my colleagues Are Raklev, Anders Kvellestad and I have proposed is that the bump is not due to chance, but due to the production of supersymmetric particles. That kind of bump is what we will be looking for in the next run of the LHC. We don't know yet if dark matter really does exist. It is a speculative idea. If we find it at the LHC then that would be an amazing result, which will appear in the history books for millennia to come. 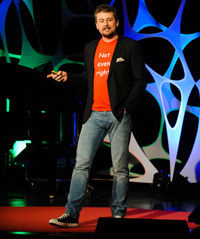 Ben Allanach is a Professor in Theoretical Physics at the Department of Theoretical Physics and Applied Mathematics at the University of Cambridge. His research focuses on discriminating different models of particle physics using LHC data. He worked at CERN as a research fellow and continues to visit frequently. Thanks for the scale reference, bottom left. I no longer have to worry about CERN employing Gerbillinae.